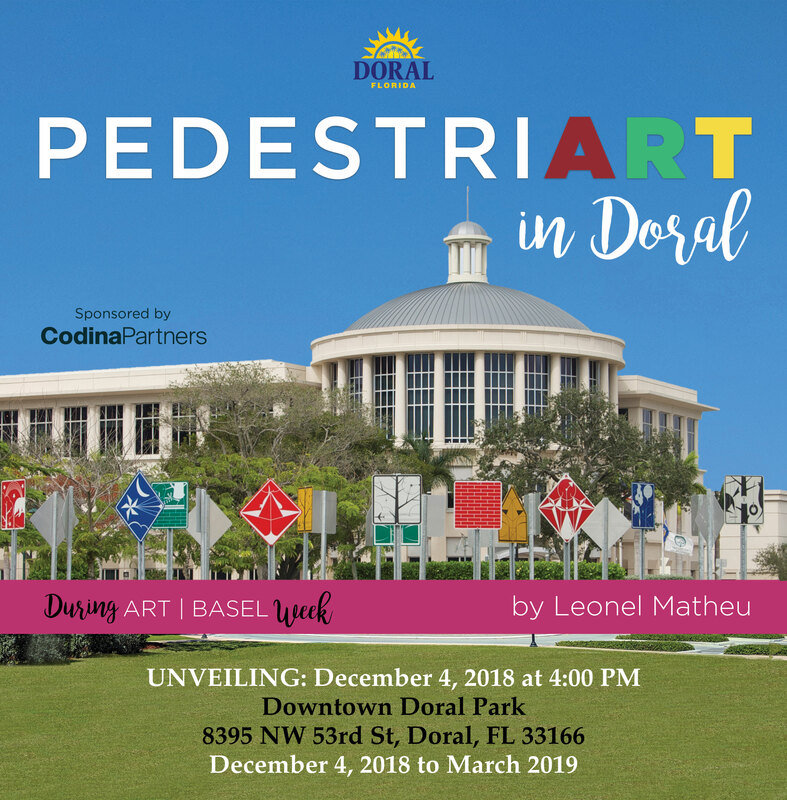 Doral, FL – This year, art makes it out west to Doral in the form of a Pedestriart Urban Art Project by Leonel Matheu! The project consists of traffic signs in its form and codification of color utilizing an iconography to stimulate the pedestrian’s conscience through infinite range of interpretation. The installation, sponsored by Codina Partners, provides inspiring and interactive, creative experience through its graphic imagery to contribute to the enrichment of the community. The signs will be unveiled in the popular Downtown Doral Park, on December 4th at 4:00pm. Following this exhibit, 10 signs with will be permanently displayed around the City to continue promoting art in public places and enriching how we communicate with our residents and visitors. These signs will have custom-made graphics that show messages from the City’s “We Don’t Do That Here” campaign – which is intended to encourage citizen responsibility in the community through the following of the rules and laws. The Pedestriart Urban Art Project has successfully been implemented in different cities across the United States, including the City of Miami, and overseas by Leonel Matheu. Mr. Matheu is an award-winning, Cuban born contemporary artist and prominent figure in the international arts scene for over twenty years. His artwork is included in the collections of various art museums, among them the Museum of Contemporary Art in North Miami; The Patricia and Philip Frost Art Museum at FIU in Miami; The Lowe Art Museum in Coral Gables; The Bass Museum of Art in Miami Beach; The Young At Art Museum in Davie; Georgia Museum of Art at University of Georgia in Athens; and more. WHERE: Downtown Doral Park, 8395 NW 53rd St.